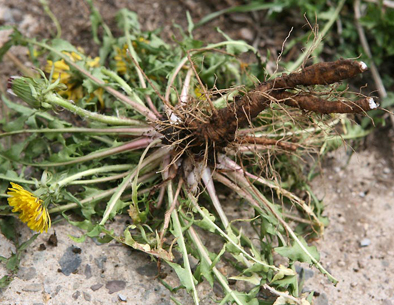 Dandelion is most often thought of as a pesky weed that takes over in lawns, gardens, meadows, and even pops up in cracked sidewalks and pavement. It is invasive and pervasive. Lucky for us, it is also an excellent food and herbal medicine that anyone can find, grow, and put to use. Dandelion is a very rich source of beta-carotene which we convert into vitamin A. This flowering plant is also rich in vitamin C, fiber, potassium, iron, calcium, magnesium, zinc, and phosphorus. It is a good place to get B complex vitamins, trace minerals, organic sodium, and even vitamin D. Dandelion contains protein too, more than spinach. It has been eaten for thousands of years and used to treat anemia, scurvy, skin problems, blood disorders, and depression. Seeds grow readily in your garden, planter boxes, or pots. If you collect them wild, try to choose ones you know have not been subjected to pesticides, fertilizers, and other chemicals. The ones in your lawn are not the best. Pick them instead from a mountain meadow or abandoned lot. Seeds can be bought or you can gather them from the familiar puff balls you see each summer. Dandelion leaves can also be found fresh in some health food markets or as a freeze-dried herb. Dandelion tea, capsules, and tinctures are also available. – Dandelion acts as a mild laxative that promotes digestion, stimulates appetite, and balances the natural and beneficial bacteria in the intestines. – This weed-like superfood is a diuretic that helps the kidneys clear out waste, salt, and excess water. This inhibits microbial growth in the urinary system too. – Dandelion has been shown to improve liver function by removing toxins and reestablishing hydration and electrolyte balance. Antioxidants – Every part of the dandelion plant is rich in antioxidants that prevent free-radical damage to cells and DNA, slowing down the aging process in our cells. Cancer – Dandelion acts against cancer to slow its growth and prevent its spread. The leaves are especially rich in the antioxidants and phytonutrients that combat cancer. High Blood Pressure – As a diuretic dandelion increases urination which then lowers blood pressure. The fiber and potassium in dandelion also regulate blood pressure. Cholesterol – Animal studies have shown that dandelion lowers and control cholesterol levels. 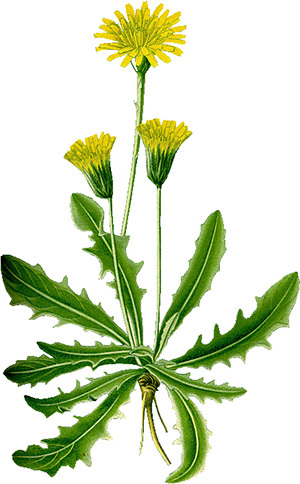 Gallbladder – Dandelion increases bile production and reduces inflammation to help with gallbladder problems and blockages. Inflammation – Dandelion contains essential fatty acids and phytonutrients that reduce inflammation throughout the body. This can relieve pain and swelling. Immune System – Animal studies also show that dandelion boosts immune function and fights off microbes and fungi. Dandelion leaves, flowers, and roots are all edible. They have a slightly bitter flavor that can be minimized by harvesting them in the fall or spring. Cooking cuts the bitter flavor as well though the leaves make a great addition to raw salads. Dandelion is generally considered safe in food and medicinal levels. Some people may have allergic reactions to dandelion. Anyone with an allergy to ragweed, chrysanthemum, marigold, chamomile, yarrow, or daisy should avoid dandelion and anyone pregnant, nursing, or taking prescription drugs should talk to a health care professional before adding something new to their diet. Wash 20g of herbs on running water ; boil for over 2 hours depending on symptom in 2L of water.